Critical Power Monitor provides revenue-grade metering functionality. Critical Power Monitor is available in corded and retrofit variants and are used to track busway system. Corded CPM comes in custom cord lengths and plug/connector body configurations. Retrofit monitor is offered in feed and plug-in unit versions and comes in small enclosure. Retrofit comes with adjustable pass-through option. Starline, the customizable, flexible power distribution and critical metering provider for the mission critical, industrial and retail markets, introduces the Corded Critical Power Monitor (CPM) and the Retrofit Critical Power Monitor (CPM). The latest additions to Starline’s line of metering options, both the Corded and Retrofit CPM offer revenue-grade metering functionality that can be implemented in existing Starline installations. "We wanted to have options for the existing users of our Starline products to implement our metering platform,” said Mark Swift, director of marketing at Universal Electric Corporation. “With the new corded and retrofit options of the CPM, customers can add power monitoring to Track Busway systems that have been installed for years in an easy and cost effective manner." The Corded CPM is a standalone device that will be assembled with the necessary plug and connector body, and can be easily added in-line. Custom cord lengths and plug/connector body configurations are available to meet the specific metering requirements of each installation. 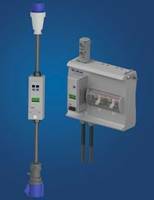 With two versions of the device available, any load up to 63 amp three-phase can have monitoring added post installation. The Retrofit CPM is available in both end feed and plug-in unit versions for existing Starline Track Busway installations. The CPM is housed in a small enclosure with an adjustable pass-through in order for the meter to be easily mounted to devices. During the design process special attention was paid to ensuring the Retrofit CPM was a cost effective solution that could be quickly implemented into and tailored to specific installations. Starline is offering two options for implementing the Retrofit CPM: in the field or at one of its global production facilities. Both of Starline’s new meter products are available with the same vast functionality as the two pre-existing devices: the M40 and M50 CPM. The Starline CPM product line can be easily implemented with BMS and DCIM packages, offers display and non-display versions, and the ability to monitor multi-circuit configurations while using both serial Modbus and a variety of Ethernet-based protocols simultaneously. The intention behind the release of the Corded CPM and the Retrofit CPM is to provide a way for Starline customers to easily upgrade their existing installations in order to take advantage of the latest energy monitoring technology.